The use of social networks for business has emerged as an important means of marketing, advertising, promoting and managing customer relationships. However, the use of social networks in business need not be restricted to these areas. Emails have been a popular means for enterprise communication and collaboration for some time now. But how many of us suffer under an overload of unnecessary communication and clogged mailboxes on this account? According to Radicati Group on average, corporate email users send and receive an estimated 117 emails per day today. One can only imagine then why most of these mails don’t draw responses. Information overload and fatigue are top reasons. Collaboration on social networks becomes a breeze simply because one can create a virtual page where people can come to find out context and history. Forwarding of emails with attachments to share context becomes unnecessary. Information that must be shared in an enterprise becomes more visible and more accessible and is no longer buried in individual accounts. Meetings usually are the platform for brainstorming, taking stock and basically a heads up. However, as most of us know and have often experienced, meetings can also be time killers and unproductive. If you have an idea and would like to pitch the same, seek feedback, co-create and collaborate then a simple post on a blog or your enterprise social network might help you garner responses quickly and with greater ease. As opposed to shooting e-mails back and forth, this will work faster. Teamwork is an inherent part of working in any organization. Very often presentations and documents are the result of a joint effort on that part of many. Peers and subordinates might provide inputs in the form of data, figures, facts, opinions and senior members might present or compile it. Usually this is done through an e-mail with the draft attachment, requesting input from colleagues/team. A lot of correspondence then ensues to integrate input/feedback. Opposed to this, uploading the file on your enterprise social network and making colleagues’ contributors or editors allows them to update sections as and when required. Typically tasks may be assigned by writing to a team member with project specifications and a description of what is expected from him/her with a deadline. Enterprise social networks give you the flexibility to create, assign and manage tasks. This way tasks are dealt with in prioritized order and any team member can see what you’re working on rather than be at the receiving end of a long thread of e-mails. As human beings all of us seek recognition and appreciation for good work done by us. If this comes in the form of a pay hike it makes us feel good but a few words of appreciation make a lot of difference. Using a public platform such as a social network to appreciate good work done by a team member helps to build motivation and foster a greater sense of belonging among employees. A badge or status update is so much cooler compared to an e-mail with a copy to team members or as a forward that might eventually get lost in the clutter or end up being deleted by many. To wrap this up, I’m certainly not saying that emails are passé. They have been and will be a part of business communication. However, as social networks emerge as a bigger platform for business communication more and more collaboration will take place in the virtual space. Companies like Parle have used social networks to keep track of stocks in retail stores. The Parle Hippo initiative wherein customers were encouraged to share information about retail outlets where they couldn’t find Hippo took stock management to a new level. 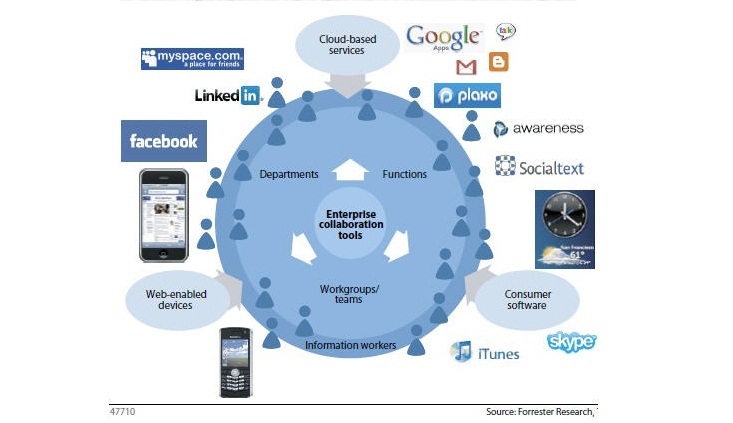 If companies get creative and thinking then social networks can become an important tool for collaboration. [Infographic] Should You Use Twitter?